Bombshell: Did the White House Cover Up Ambassador’s Murder Because They Were Warned of Attacks Months in Advance? We know the Obama administration has been actively engaged in a cover-up as to why the U.S. consulate in Benghazi came under attack on September 11th, killing Ambassador Christopher Stevens and three other diplomats. How else to explain the weeks-long campaign to convince people that the attacks were not terrorism. Now we’re finding out more details as to why they may have engaged in such a wide-ranging cover-up. Now that Hillary Clinton, the US Secretary of State, has confirmed there was an explicit link between al-Qaeda and the attack, questions are being asked about the role Dr Rice played in trying to play down the significance of the attack. The Republicans have already called for her to resign from her post for misleading the American people. But the real smoking gun is whether the Obama administration was warned in advance that al-Qaeda was planning an attack. A number of Israeli newspapers have suggested that Washington was warned as early as September 4 – a week earlier – that the environment in Benghazi was becoming increasingly hostile and anti-American, while in London the Foreign Office took the decision to withdraw all its consular staff from Benghazi two months before the murders. This decision was based on an intelligence assessment made by MI6 that al-Qaeda was openly operating in the area following a failed assassination attempt on Sir Dominic Asquith, Britain’s ambassador to Libya, in June. It is well known that British intelligence works closely with its counterpart in America, and if MI6 knew al-Qaeda was operating in the Benghazi region, then it is highly likely that the CIA did too. Suddenly the Administration’s “it’s nothing to do with us, guv,” defence is starting to look rather thin, with potentially disastrous consequences for Mr Obama’s re-election prospects. On Wednesday September 12, 2012 blogger Speak With Authority discovered that five days before 9-11, the US State Department sent out a memo announcing no credible security threats against the United States on the anniversary of 9-11. 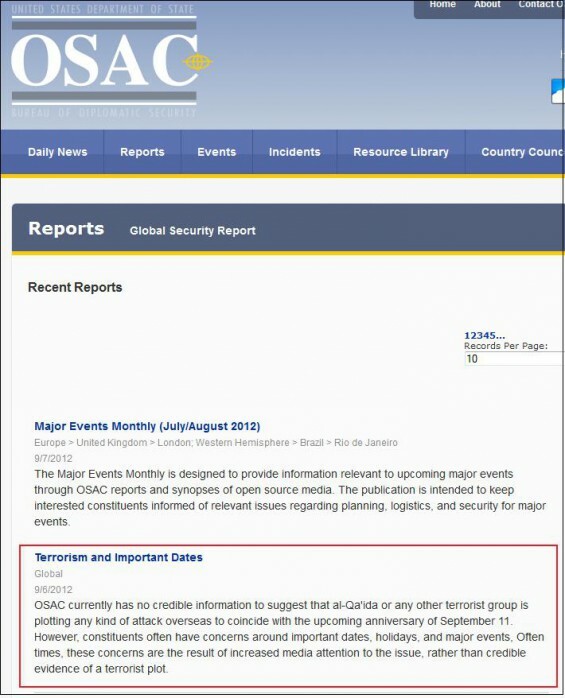 But now it’s gone.The State Department scrubbed the letter from its OSAC website. At the time that this was revealed, their had been reports that the U.S. knew of potential threats a single day ahead of the actual attacks on September 11th. But this latest report from the Telegraph demonstrates that the White House knew al-Qaeda was operating in the area in June, had specific reports of increasing hostility on the 4th, and then reported that there were no credible threats on the 6th. To have lowered security expectations despite their knowledge of threats is criminal. This is a cover up of the highest order. The Obama administration knew that attacks were possible and left U.S. consulate buildings unprotected. The administration is directly responsible for the magnitude in which those attacks became successful. And now, they are aware that there is evidence something could have been done to prevent the deaths of these four Americans. There was blood on their hands, and instead of admitting mistakes they’ve been trying to scrub the crime scene clean ever since.